This protein-rich, super healthy salad recipe – it is packed with good fats, vitamins and minerals so will certainly do your body the world of good. Everyone loves a soft, runny poached egg – especially as they are packed with high quality protein and all nine essential amino acids. Combine them with some vitamin-rich asparagus and I think you are on to a winner! Place a grill pan over a medium heat and griddle the fennel for 3-4 minutes on each side until it begins to soften and brown. Remove and set aside. Smother the asparagus in 1 tablespoon of the olive oil with your hands so that they are well covered, adding the salt at the same time. Place on the grill pan and toss every couple of minutes until they start to blacken. 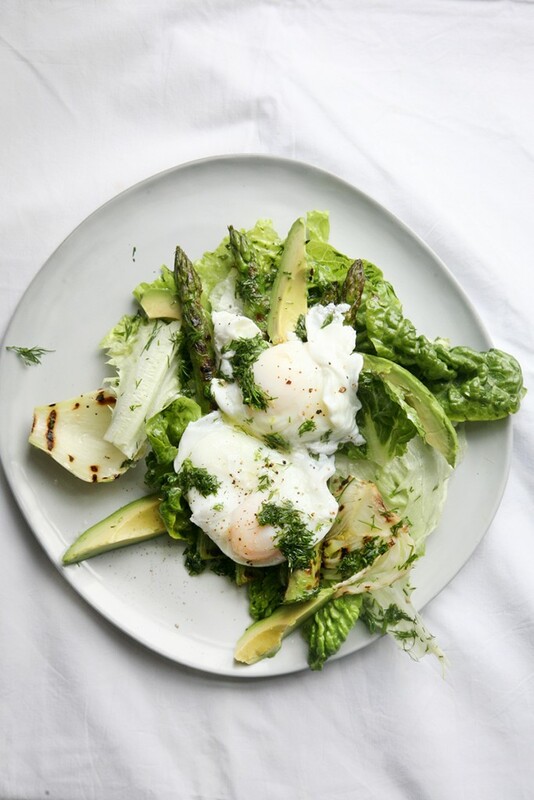 While the asparagus is grilling, prepare the salad by gently tearing the leaves of the iceberg and baby gem lettuce and setting aside in a bowl. Meanwhile, make the dressing by stirring all of the ingredients together in a glass. When the asparagus have got some good colour on them – usually after around 5-6 minutes – you may need to give them a little help to cook right through. To do this, just splash around 3 tablespoons of water into the pan. It will sizzle quite a bit but the steam from the water will help to cook them through. Dress the salad (keeping some aside to drizzle over the top) and mix through with your hands. Lay onto a plate and place the asparagus on top with the fennel and sliced avocado. Bring a pan of water to the boil and gently crack the eggs into it. You don’t need to do a thing to the water before you drop the eggs in (I know some people say you need to swirl it with a spoon first, while I am sure there are other methods, too). Gently simmer the water for a minute or two or until the whites of the eggs are no longer translucent. Remove with a slotted spoon and place over the asparagus. Drizzle the top with the remaining dressing and enjoy!